"This is another one of my creations. I was messing around in the kitchen and this is what happened. I'm still working on it so I am looking for feedback. This is more of an appetizer or finger food." Stir the feta cheese, pimento peppers, Greek seasoning, black pepper, and olive oil together in a bowl; place about 2 tablespoons of the mixture on each of the 8 bell pepper segments. Wrap each segment with a slice of bacon; secure with toothpicks and arrange on a baking sheet. 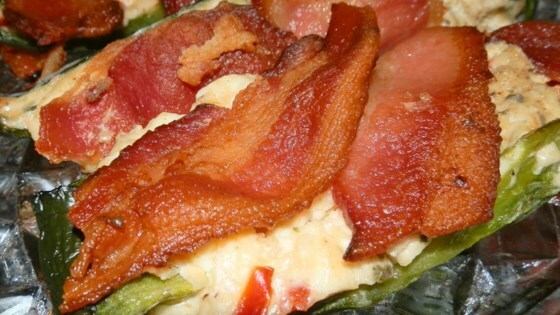 Bake in the preheated oven until the bacon is brown and beginning to crisp, about 20 minutes. Serve hot. Variation-try some couscous for filling, add some fresh spinach and sundried tomatoes,garlic and crumble bacon into mix and stuff whole pepper. Super delicious! LOVED this recipe!!! Didn't have pimento peppers, but followed everything else to a "T" and it was delicious!!! Will definitely make this again....and again and again and again! My husband and his friends found this stuffed pepper recipe to go fantasticly over a steak. With a little adjusting you could grill them for a great addition to any outdoor dinner.